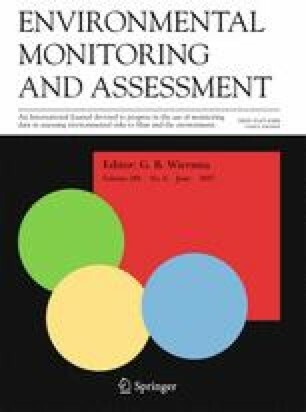 The levels and distribution of polycyclic aromatic hydrocarbons (PAHs) in surface water, sediment, and fish (Clarias gariepinus) samples from Ovia River, Southern Nigeria, were evaluated, to assess the contamination profile, dietary intake, and human health risks associated with exposure. Results showed that naphthalene, acenaphthylene, and fluoranthene were the most dominant contaminant in water, sediment, and fish, respectively, with mean concentrations (μg/L) of 3.08, 45.4, and 90.7. Spatial distribution showed high occurrence of PAHs in Ekenwan, the downstream station, for all the matrices. Source identification using multivariate analysis revealed mixed patterns of pyrogenic and petrogenic origins. Estimated daily intake (EDI) of PAHs through fish consumption ranged from 2.18 × 10−7 to 5.23 × 10−5 mg/kg/day; values were however lower than the reference dose (RfD) indicating low risk. Estimated values for hazard quotients (HQs) and hazard index (HI) for both non-carcinogenic and carcinogenic risks were below 1 indicating low risk through dietary and non-dietary exposure to water, sediment, and fish from Ovia River. However, estimated HI values for direct ingestion of sediment were above 1, indicating the possibility of non-carcinogenic health risk from exposure. Carcinogenic risk indices also indicated low risk from fish consumption. In spite of the assessed low risk from exposure, continuous monitoring of PAH levels in this water body is imperative to prevent future human health effects. The authors appreciate the contributions of Billy and Tonia. Federal Environmental Protection Agency (1991).Guideline and standard for environmental pollution control in Nigeria. http://www.who.int/water_sanitation_health/resourcesquality/wpccasestudy4.pdf?ua=1. Food Agriculture Organization (FAO) (2014). Fishery and aquaculture statistics 2014. Statistics and Information Service of the Fisheries and Aquaculture Department/Service. 2014, p. xvii. FAO, Rome, Roma. http://www.fao.org/3/a-i5716t.pdf. Gale, P., Reddy, K., & Graetz, D. (1992). Mineralization of sediment organic matter under anoxic conditions. Journal of Environment Quality 21, NP. doi: 10.2134/jeq1992.00472425002100030016x. Ravindra, Mittal, A., & Van Grieken, R. (2001). Health risk assessment of urban suspended particulate matter with special reference to polycyclic aromatic hydrocarbons: a review. Reviews on Environmental Health, 16(3). doi: 10.1515/reveh.2001.16.3.169. Tongo, I., & Ezemonye, L. I. N. (2015). Human Health Risks Associated with Residual Pesticide Levels in Edible Tissues of Slaughtered Cattle in Benin City, Southern Nigeria. Toxicology Report, 2, 1117–1135. doi: 10.1016/j.toxrep.2015.07.008. Wu, W., Ning Qin, N., He, W., He, Q., Ouyang, H., & Xu, F. (2012). Levels, Distribution, and Health Risks of Polycyclic Aromatic Hydrocarbons in Four Freshwater Edible Fish Species from the Beijing Market. The Scientific World Journal, 2012, 1–12. doi: 10.1100/2012/156378.